You are currently browsing the tag archive for the ‘Keller Auditorium’ tag. When we’re talking about live shows, performance and production can be words to describe the same thing. I recently saw two shows and for one I declared “That was a production!” and for the other, I was moved by the performance. They were equally wonderful and nothing alike. I’ll try to explain. Tara, my 21-year-old-offspring, loves all things Disney and Broadway. Thus, tickets to Aladdin were an obvious choice for a Christmas present. I did not know anything about the show and did not take the time to look it up. Consequently, I was totally blown away on Thursday when I saw this show. The creators pulled out all the stops for entertainment. This was the sparkliest, loudest, flashiest, most-colorful, most frequently jaw-dropping, silliest, gaudiest show I have ever seen. 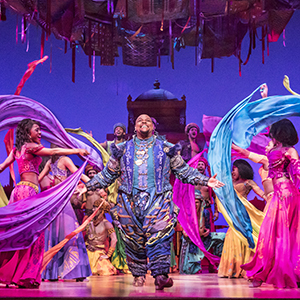 The costume changes were constant, and every costume was layered in mesmerizing colours and more rhinestones and sequins than I thought possible to fit on fabric. There were scarves and bangles and turbans and feathers and every single, every single male character wore pointed shoes. At one point, cannons shot metallic glistening streamers over the audience and we sat transfixed, watching them spiral down onto us. Golden cave of treasures, where Aladdin (Clinton Greenspan) finds the lamp. Back up dancers and singers, male and female, supported nearly every scene, and these were the fittest performers I’ve seen in a Broadway show. I could tell because most of them were only about 50% covered in clothing. It was nice to see men objectified for a change. All those glistening six-packs….sigh. They leapt, spun in the air, spun on the ground, flipped and skidded and cartwheeled back and forth. The sets were incredible, in the literal definition of the word. 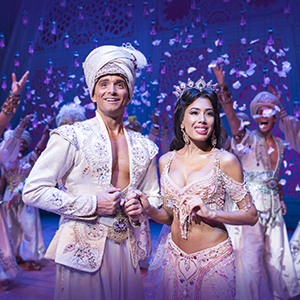 At one point the whole back of the theatre dropped away into a convincing starry night sky…WITH a legit flying carpet that Aladdin and Jasmine sat on and sang A Whole New World to us. 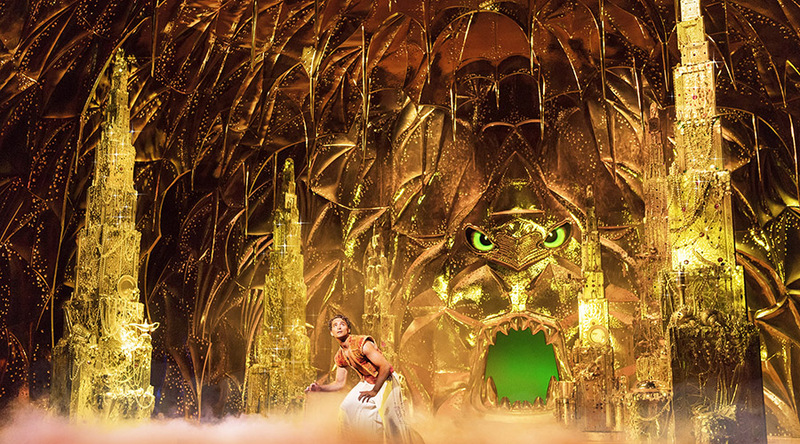 The scene inside the cave of treasures, where Aladdin found the lamp, looked like it was made of solid gold. Indeed, every surface shone like metal. This made it particularly splendiferous when the fireworks went off. YES!! Real fireworks inside the theatre! 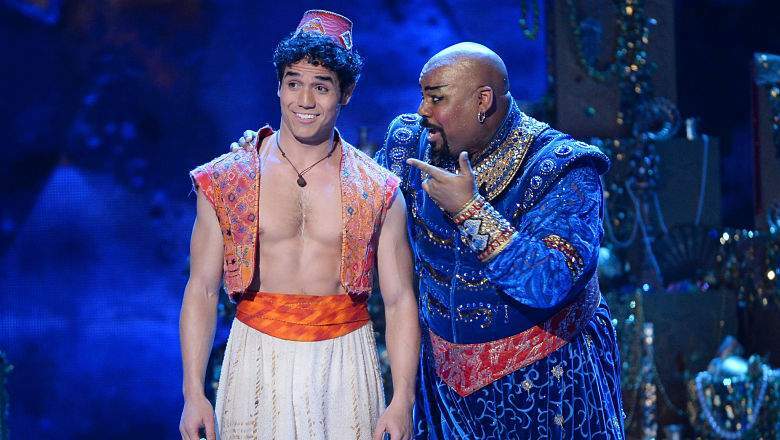 Genie explains to Aladdin how the three wishes work. Genie was hilarious, Jasmine was convincingly strong, Aladdin convincingly vulnerable, and Jafar sufficiently evil. We were all glad to see him change from one costume to another in a blink before our eyes like magic, and then just as quickly disappear leaving only a lamp behind, when Jafar foolishly wished to be an all-powerful genie (and therefore had to live in a lamp). What. A. Show. What a production!! Storytelling took center stage in Cheryl Strayed’s Tiny Beautiful Things. 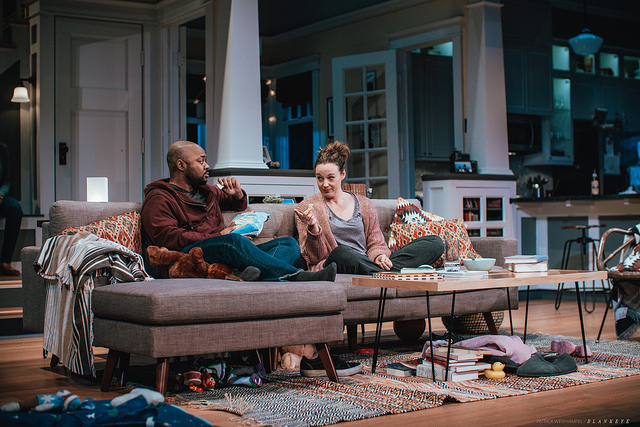 This play is based on the book, which is about an advice columnist named Sugar, and the letter-writers who contact her and sometimes get responses. The set was great!! So perfect and beautiful. I wish we were allowed to take photos during performances, so I could have captured just one shot that showed the whole thing. Multiple times during the show I thought how nice it would be to live there. If you look at the kitchen shot above, imagine a small dining table to the right, with a door off stage on the right to the laundry room. On the far left of the photo, you can see two steps leading to a playroom in the back. Imagine that farther to the left, there is a living room with a couch and table, and behind the couch is the front door leading off stage on the left, and at the very back a staircase upstairs, and a door to the basement? beneath the stairs. Sugar “listens to” one of her letter-writers. We watched Sugar, a busy mom, as she carried her laptop with her around the house, answering mail (outloud) all day long as she does the laundry, folds clothes, picks up toys, straightens the living room. 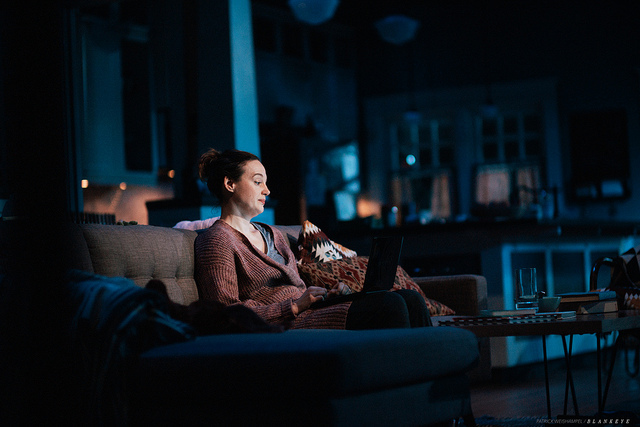 We also watch as three other actors perform the words of the letter-writers, who are children, people with cancer, or people who are pregnant. Letter writers told their secrets, exposed their fantasies, regretted their choices. Gender, age, and background aren’t visually reflected by the actors, so we had to listen carefully to the words to find out who was speaking. Sugar didn’t answer everyone. She wore yoga pants and a cardigan, and at one point pulled her long hair back into a sloppy bun while she read the letters. One writer kept submitting the same letter over and over, that said, “WTF. WTF. WTF?” She didn’t answer that one, obviously. Until…. the end. The way Sugar answered the questions was to tell a story from her own life (taken from true stories of Strayed’s actual life) filled with pain and tragedy, joy and fear and bravery and hope. She connected to the letter-writers by telling what got her through her own similar challenges, and recommended that we be more compassionate, kind, and generous – particularly to ourselves. 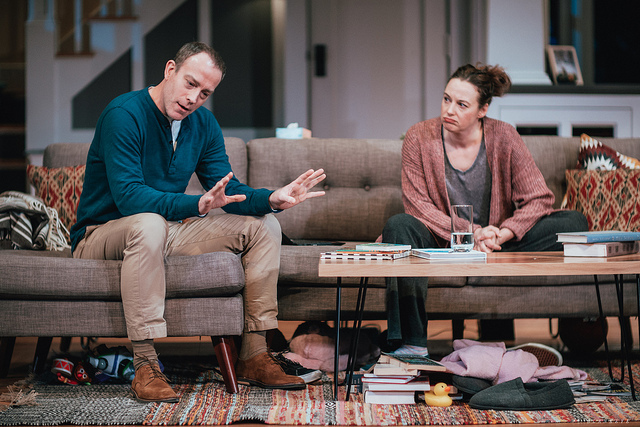 It was thirty stories told, hers and theirs, linked by the advice column, and a thousand stories told, linked by all the people laughing and crying in the audience. Proof that we were all feeling these stories as our own. Sugar answers a letter at night, after the day’s chores are done. Sugar dispenses advice to a letter-writer. Sugar would usually speak to her laptop as she answered letters, even while the letter-writer was sitting beside her on the couch, speaking to his phone as he typed his question. But when the topic or the connection got more intense, they would turn and face each other, and have a conversation. During one wonderful scene, she brought all the letter-writers into the kitchen with her to help pack school lunches for her kids while she answered a letter. Live performances get to me more than TV or the movies (and all of these actors have been on TV or in the movies). This show was deeply personal, designed to make the audience reflect, or identify, or consider. 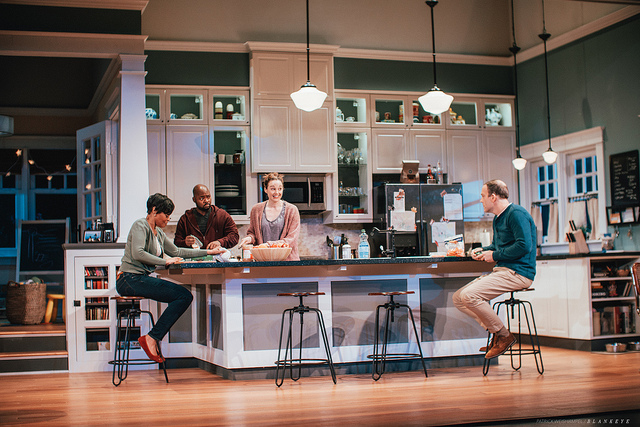 Ultimately, this play took up all the parts of us that are dark, acknowledged them, and then made us feel good anyway. It is wonderfully done.